Contest: We're Making It Rain $150 Cash Giveaway! We're Making It Rain $150 Cash Giveaway! 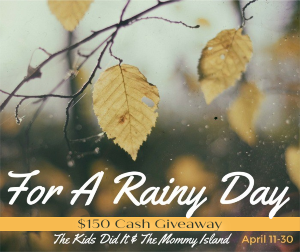 Prize: Win big during our $150 For A Rainy Day April Cash giveaway event! You have the option of choosing between $150 PayPal Cash OR a Gift Card of choice! Statistics: This contest was opened by 82 and entered by 6 ContestChest.com members. 7% of those who opened the contest, entered it.